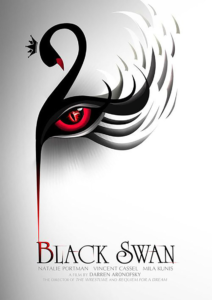 For this assignment, I chose a reimagining of the Black Swan poster by Hung Trinh. I found the image while searching for an image for the photoshop workshop. On the grid, the separation of the poster is more evident to me. The swan, text, and negative space, are all centered on the page. The upper third of the poster is dominated by the swan, your eye almost immediately drawn to the eye housed in the swan’s body. The left third of the poster swan’s head and neck, as well as the line from the tear duct of the eye to the “B” in the title. The negative space is used well, the gradation from dark to light expresses the movie themes without being overpowering. The colors used are mainly black, shades of grey, and varying shades of red as an accent. I found that even with the poster being made of mostly dark colors, it didn’t feel heavy or overpowering. 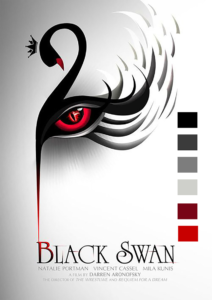 Using red as an accent color adds a sense of direction, connecting the swan to the title. The typography is likely a modified Trajan Regular font. It feels fanciful without being overly so, and grounds the bottom third of the page.